Sun., March 17, 2019, 9:41 p.m.
For generations dating back to the 1930s, throughout Mexico, including in this region in the central state of Guanajuato known as El Bajio, the towns have emptied themselves out of their youths during what’s called the “winter blues.” The young would head north to seek out their own version of the American Dream: Jobs. In North Texas and other places they worked in everything from gardening, to restaurant service, to roofing and to constructing some of the area’s most iconic buildings. They helped build D/FW International Airport, Texas Stadium and just about every high-rise in Dallas. Traveling through a half dozen towns to ask the locals whether they wanted to work in Texas, the answer was sometimes evasive, but more often emphatic: no. Their choices will have far reaching consequences for the U.S., particularly in North Texas, experts and economists say. Overall migration to the U.S., predominantly led by Mexicans, is at a historic low, down from a peak of 1.6 million in the year 2000 to less than 400,000 last fall. Plainly put: More Mexicans are leaving the United States than arriving there. Demographic changes such as smaller families, plus fears about security along the northern border, nativist anti-immigrant policies in the U.S. and, perhaps most of all, a surging Mexican economy are keeping many satisfied that Mexico is where they belong. And there’s a widespread rare sentiment here, too – hope. A great deal of that hope springs from Mexico’s President Andres Manuel Lopez Obrador, known as AMLO, who marked his 100th day in office this month. For now, Mexicans are feeling good about their man-of-the-people president. Many believe a real transformation is underway; that a brighter future looms, say experts like Carlos Bravo Regidor, a professor at CIDE, the Center for Research and Teaching in Economics in Mexico City and a media commentator and columnist for Reforma newspaper. Lopez Obrador, who won last July’s presidential election with a historic 53 percent of the vote, remains strong in the polls, with an approval rating hovering at or about 80 percent, according to several publications. A whopping 73 percent of those surveyed believe the country will improve under his presidency. Luis Carlos Padilla slices mangos and prepares corn-on-the-cob for the San Miguel de Allende crowd bound for Mexico City by car. He laughed when asked about migrating north. Many Mexicans believe a transformation is underway and trust in Lopez Obrador’s almost daily promise that he will make significant inroads against corruption and impunity. They were pleased when he ditched the presidential palace, plane and motorcade. He flies coach. They appreciate that he’s folksy, good natured with dry humor, and every morning at 7 a.m. dominates the airwaves with a news conference. When he launched a military assault on the country’s fuel theft gangs, the move seemed hasty and led to gas shortages across the country. But his popularity soared. And perhaps more importantly, many believe AMLO will make Mexico a more just and equal nation. In a country where the rich are few but potent, that’s a powerful promise. Over the last few weeks, in dozens of interviews, such opinions resonated among Guanajuatenses, in the so-called Bajio region, known as the Heart of Mexico. Ironically, Guanajuato is the only state that AMLO’s MORENA party lost in the election. Still, in towns from here in San Diego de las Trasquilas, outside of San Jose Iturbide, Pozos, San Luis de la Paz, Doctor Mora, and San Miguel de Allende, all with strong ties to Dallas, many expressed more of an interest in staying in Mexico than leaving. Pedro Vizcaya Tonala spent 10 years – from 1998 to 2008 – in Dallas, until he was deported. He was making four times what he makes now as a technician in Mexico at an aerospace company. In Texas, he lived in an apartment with four other men near Oak Cliff where he worked as a dishwasher and busboy, gardener and roofer. His colleague, Ana Campuzano, 22, has never even considered migrating to the U.S. Sometimes, she said, family members, including her father, grow nostalgic when they watch movies set in cities where he once worked, like Chicago and Dallas. Lopez Obrador’s popularity comes amid some setbacks. In recent weeks, drug violence has flared up in several regions, particularly along the Texas-Mexico border. Leading credit ratings agencies, including Standard & Poor’s and Fitch, issued warnings about Mexican sovereign debt. And despite Lopez Obrador’s insistence that the economy will grow at 4 percent annually, growth is anemic, projected to be as low as 1.5 percent by some economists. Some investors, including in the Dallas-Fort Worth area, are nervous. Some economists and business leaders, including in North Texas, are nervous, too. They need laborers. Labor scarcity is playing out in the U.S., especially among low and mid-skilled workers, Orrenius said. Difficulty hiring impacts economic growth and increases labor costs. Some investment projects are not viable at higher costs, she said. U.S. labor force growth will continue to slow over the next 10 years. “Mexican migration to the United States keeps dropping, even with a strong U.S. economy, but migration from Central America, Asia, and Africa is up, and these will likely be the new sources for immigrants in the United States,” said Andrew Selee, president of the Washington-based Migration Institute. The trip through the towns of Guanajuato continued amid a sea of new construction. At one gas station, the attendant, Camilo Loya, who once worked in Chicago, offered a solid tip to where to find migrants headed north. Drive closer to the railroad tracks, he said. 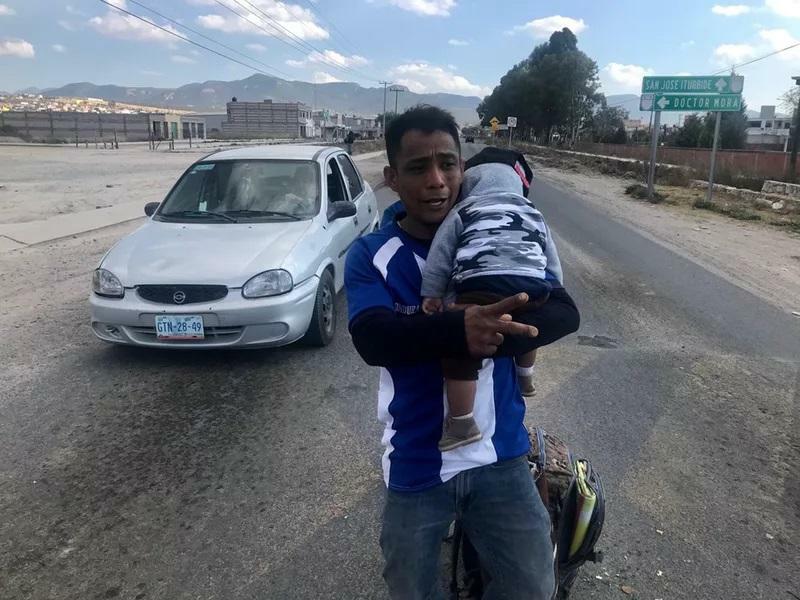 There, about an hour away, on a busy street, stood Jonathan David Cardenas, 32, with his 8-month-old son and his wife, asking for handouts from motorists. They were part of a caravan that originated in San Pedro Sula, Honduras, and were headed for Houston. “We’re looking for the American dream,” Cardenas said. Published: March 17, 2019, 9:41 p.m.